The Greek PM described his relationship with Erdogan as one of 'respect, honesty and directness' but noted that those ties were 'challenged in very difficult moments'. Speaking on the eve of his 5 February talks with Turkish President Recep Tayyip Erdogan, Prime Minister Alexis Tsipras told Turkey’s state-run Anadolu Press Agency that despite the serious problems in bilateral relations, these can be transcended with persistence and good will, but above all through open channels of communication and dialogue. "The conditions must be created in Greek-Turkish relations for historic steps to take place,” Tsipras said about the prospects of bilateral relations. 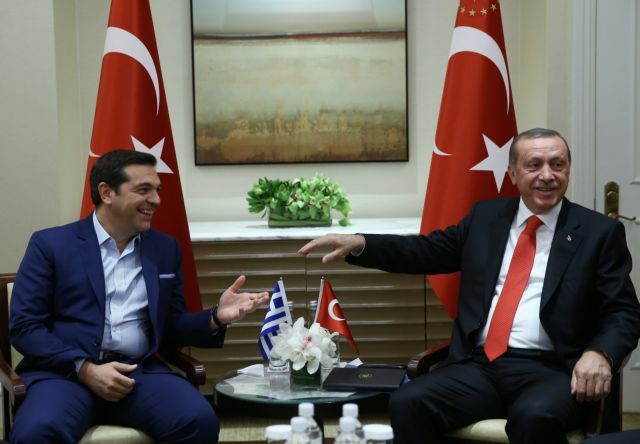 The Greek PM described his relationship with Erdogan as one of "respect, honesty and directness" but noted that those ties were "challenged in very difficult moments". Those moments included Ankara’s imprisonment of two Greek military officers who were later freed and its demand that Greece extradite eight Turkish officers who have been granted political asylum by the Greek judiciary. The main challenge and greatest problem in bilateral relations, however, is Ankara’s persistent claims against Greek sovereign rights in the Aegean and its efforts to hinder Cyprus energy and gas-drilling programme. In this regard, Athens aims to find mechanisms of communication that can help de-escalate Aegean tensions. "But it (the relationship with Erdogan) allowed us to consolidate channels of communication on many levels, to overcome obstacles and to be able, today, to speak of a positive agenda," he said. Keeping channels of communication between Athens and Ankara at every moment because problems can be solved only with dialogue is the overarching message of the Greek side on this trip, as was confirmed by government spokesman Dimitris Tzanakopoulos. It is indeed a pressing message at a time when Turkey is challenging Greek sovereignty in the Aegean and is interfering with the gas exploration programme of the Republic of Cyprus on the grounds that Turkey and the Turkish Cypriots must be a partner to and approve of initiatives in Cyprus’ energy programme. "During my visit I believe we will have the chance to continue the difficult, but frank dialogue we started in December 2017 and to pick up our positive agenda from where we left it," Tsipras said of Erdogan’s visit to Athens over one year ago. That visit was viewed as a fiasco by opposition parties and analysts in Greece as Erdogan publicly presented a list of demands that touch on issues of sovereignty and which Greece has steadfastly rejected for many years. Tsipras will also hold crucial talks with Ecumenical Patriarch Vartholomeos, who did not hide his consternation over the fact that the PM reached an agreement with Archbishop Ieronymos of Greece on Church-State relations, church properties, and the salaries of clergy without consulting the Ecumenical Patriarchate, which has spiritual authority over dozens of dioceses in Greece. The raging battle between the Moscow Patriarchate and the Ecumenical Patriarchate is also expected to be reviewed at the meeting. Moscow is up in arms over the fact that Vartholomeos granted independence from Moscow (autocephaly or self-rule) to the Orthodox faithful in Ukraine. The PM’s visit to the Patriarchate’s Halki Theological seminary, which was shut down by Ankara in 1971, will be a symbolic message about the importance of religious freedom for the first-ranking Church in Eastern Orthodoxy. Also symbolically, Tsipras will be the first sitting Greek Prime Minister to visit the Hagia Sophia Museum in Istanbul, even as Islamic groups are clamouring for the splensid Byzantine Cathedral and later mosque to once again be turned into a mosque. It was turned into a museum under the rule of Kemal Ataturk, the founder of the Turkish Republic. In his interview with Anadolu, Tsipras strongly defended the Lausanne Treaty, which among other issues governs the status of the Muslim minority in Greece (it does not recognise a Turkish minority as Ankara would have it) and the Greek minority in Turkey, and which Erdogan has said should be revised. "The Treaty of Lausanne is the applicable international convention regarding minorities, so we inform each other on relevant developments on this basis," Tsipras said, noting that it is a Greek domestic issue and not a bilateral one, even though the two sides discuss it. "We have made important steps until now on the implementation of Sharia law, the structure and function of the Mufti offices and educational issues. We will continue in this direction," Tsipras said, referring to certain concessions on the part of Athens. The refugee and migrant issue was high on the agenda for talks and Tsipras called on the EU to “do all it can” to support Turkey in dealing with its four million refugees and migrants. "I believe that Turkey has assumed the great burden of hosting four million refugees. That should always be recognized by the international community and the EU should do all it can to support our neighbor," the PM said. Tsipras is also stressing the importance of the 2016 EU-Turkey statement on dealing with migration flows. "As a result (of the deal), illegal flows and especially deaths in the Aegean, drastically decreased," he said, calling for a more intense cooperation on the issue, as the Aegean islands have borne the brunt of the refugee flows. "The EU, for its part, has to find a way to strengthen the support it shows to countries that are the most affected from the flow and to reject agendas that are not compatible with European law or humanitarian principles," Tsipras said, in yet another call for EU burden-sharing in dealing with the migration crisis. Regarding the prospect of jump-starting Cyprus settlement talks, Tsipras said the sides should keep working for "a fair and viable solution based on UN Security Council decisions". "The reunification of the island on this basis, is the only possible solution," he said, calling for "effective preparatory meetings" on the security issue with Ankara, which insists on retaining a right of intervention on the island based on a skewed reading of the 1960 Treaty of Guarantee, which established Greece, Turkey, and the UK as guarantor powers. Britain retains sovereign bases on the island.